The Canadiens announced the recall of winger Dale Weise from Laval (AHL). He was sent down last week to accommodate the return of Paul Byron from IR but this move was expected with the 23-man roster limit now removed. Weise played in three games with the Rocket, scoring twice. He will likely battle for fourth line ice time down the stretch. The Devils have shuffled their forward group, announcing that they have sent wingers Joey Anderson and Brett Seney to AHL Binghamton while recalling forwards Michael McLeod, Nathan Bastian, and John Quenneville. Anderson has just three points in 19 NHL games this season while Seney has spent the bulk of the year in New Jersey, collecting 13 points in 50 NHL contests. McLeod, a 2016 first-rounder, has played just once with the big club this season but sits second on Binghamton in scoring and should now get a longer look to assess his development. Bastian has also played just once in New Jersey but leads Binghamton in goals with 17 in 56 games. 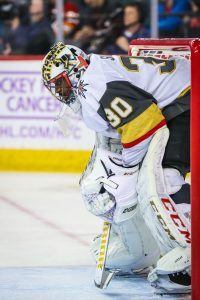 They also announced that goalie MacKenzie Blackwood has been recalled from Binghamton following the trade of Keith Kinkaid, as well as defenseman Egor Yakovlev, with Eric Gryba heading back to the AHL. For the time being at least, the Senators have re-assigned defenseman Cody Goloubef, centers Logan Brown and Filip Chlapik, and winger Drake Batherson to Belleville of the AHL, per a team announcement. The team also made forward Rudolfs Balcers and defenseman Christian Wolanin paper transactions for the inevitable reality of last-place Ottawa having an early end to their season, but Belleville continuing on to the postseason. The Flyers have brought back defenseman Samuel Morin from his conditioning stint with AHL Lehigh Valley. He has been working his way back from ACL surgery from an injury sustained in the minor league playoffs back in May and played in a pair of games with the Phantoms. It’s likely that Morin won’t be thrown into action with Philadelphia right away but with the roster limit gone, they can have him on the active roster from here on out. The team also made defenseman Philippe Myers and forward Corban Knight paper transactions. The young Myers was the top defender for the AHL’s Lehigh Valley Phantom prior to his recall, while Knight is an experienced AHLer who can lead a team. Their return for the postseason would be a major boost for the Phantoms. The Nashville Predators have recalled Matt Donovan from the AHL, placing Dan Hamhuis on injured reserve. Donovan is leading all Milwaukee Admirals defensemen in scoring with 29 points through 55 games, but hasn’t played an NHL game since 2014-15. Christian Dvorak has officially been recalled from his conditioning stint with the Tucson Roadrunners, meaning he’ll be back on the ice for the Arizona Coyotes soon. The young forward has missed the entire season up to this point, but could give the Coyotes a much needed offensive boost down the stretch. Matt Luff was recalled by the Los Angeles Kings today, only to be returned to the AHL’s Ontario Reign later on alongside Michael Amadio. It’s unclear if this move was intended for AHL postseason means, seeing as the Reign are in last place in the entire league and aren’t going to be heading to the postseason. The Vancouver Canucks have returned goaltender Marek Mazanec and forward Zack MacEwen to the AHL’s Utica Comets, the team announced. Mazanec’s demotion is good news for the Canucks; Thatcher Demko has been cleared for action and will dress for the Canucks as the backup tonight. Teddy Blueger has been reassigned to the Wilkes-Barre Scranton Penguins, but could be on his way back up shortly. With Tanner Pearson shipped out of town, Pittsburgh needs another forward and Blueger has been the next man up. He should get a chance at regular minutes down the stretch. Collin Delia will return to the minors upon the activation of Corey Crawford, Chicago announced. Delia has performed admirably in net during Crawford’s absence and even earned a contract extension with his play, but needs the starts available in the AHL rather than sitting behind Crawford and Cam Ward. With the Toronto Maple Leafs trading away Par Lindholm today, stating their desire to open up regular NHL minutes for Trevor Moore, it is no surprise that Moore was an emergency recall by the team. Moore has been the epitome of consistency through his time with the University of Denver and AHL Marlies and now hopes to bring that same dependable production to the NHL. The Arizona Coyotes made a pair of paper transactions, assigning defenseman Ilya Lyubushkin and forward Conor Garland to the AHL’s Tuscon Roadrunners – to ensure their AHL postseason eligibility – and then called them back up. The Carolina Hurricanes followed suit, making forwards Saku Maenalanen and Warren Foegele paper transactions, so that they may compete with the AHL’s Charlotte Checkers if need be. The Dallas Stars are without Mats Zuccarello after just one game with the trade addition. To fill his roster spot for the time being, the team has recalled Denis Gurianov from AHL Texas. Gurianov has shown flashes, but inconsistency in the pros, but now Dallas needs him to be a reliable option over the next four weeks. Daniel O’Regan seemed like a likely trade candidate as a young impending free agent who has not been a fit in Buffalo. The Sabres even showcased him this past week, but to no avail. The deadline has come and gone and Regan is still a Sabre, or more accurately a Rochester American after being demoted today. Tage Thompson was a paper transaction for the club. Dylan Sikura was made a paper transaction by the Chicago Blackhawks, as well. While the team would like to see what he can do in the NHL over the next month, the Blackhawks are trending away from the postseason, making Sikura’s best bet at postseason play a return to the AHL’s Rockford Ice Hogs. The move today maintains his eligibility to do so. The Colorado Avalanche made dependable depth forward Sheldon Dries a paper transaction, but the reassignments of fellow forwards A.J. Greer and Andrew Agozzino were not just formalities. The pair will head back to the AHL’s Colorado Eagles, having presumably lost their roster spots to the healthy Colin Wilson and the acquisition of Derick Brassard. Goaltender Harri Sateri, defenseman Filip Hronek, and forward Filip Zadina were all made paper transactions by the Detroit Red Wings. Sateri and Hronek are currently filling in as injury replacements and will likely return to the AHL for real in short time, but Detroit wants to see what top prospect Zadina can do in the NHL down the stretch. The Red Wings surely won’t be making the playoffs though, so they made sure the trio can all still experience a postseason run this year. The Edmonton Oilers made veteran minor league forwards Brad Malone and Josh Currie paper transactions. The duo is currently helping out in the NHL, but with the Oilers’ playoff hopes all but dead, their major role the rest of the way will likely be as experienced leaders guiding the AHL’s Bakersfield Condors into the postseason. Jordan Greenway, Luke Kunin, and new addition Ryan Donato were all made paper transactions today by the Minnesota Wild. The trio is very much part of the Wild’s immediate plans this season, as well as their future, but Minnesota may not make the playoffs this year and the forwards could benefit from making a run with AHL Iowa. New York Islanders defenseman Devon Toews was another paper transaction. Toews has carved out a role for himself with the club, which currently leads the Metropolitan Division, but should be be available to the AHL’s Bridgeport Sound Tigers come playoff time, a return to the team at a critical time would only further his development. Lukas Radil was a paper transaction for the San Jose Sharks today. The Sharks are hoping to make a deep playoff run this year, but on the off chance that doesn’t materialize, the experienced forward Radil would be of benefit to the AHL Barracuda. The Vancouver Canucks currently have defensemen Ashton Sautner and Guillaume Brisebois on the roster as the team battles injuries. However, to make sure the AHL’s Utica Comets were not stripped of two of their top defenders this season, Vancouver made the pair paper transactions today. The Winnipeg Jets announced that they have reassigned defenseman Tucker Poolman to the AHL’s Manitoba Moose today. The move was expected after the Jets traded for not one but two defenseman today. The move also serves to ensure Poolman can play in the AHL postseason if need be. The same goes for forward Mason Appleton, who was also sent down. Peter Cehlarik and Karson Kuhlman have both been returned to the AHL’s Providence Bruins, but it remains unclear if this is a paper transaction or an actual move by Boston. With the deadline passed and roster restrictions nullified, one would think that Cehlarik and Kulhman – who have both player regular minutes for the Bruins of late – would be back up. However, no such move has been made and perhaps the team simply wants to give the duo some more ice time in the minors now that their NHL roster includes several more veteran members up front. The Anaheim Ducks have demoted defenseman Andy Welinski and forward Sam Steel in favor of defenseman Korbinian Holzer and goaltender Angus Redmond. The move may have something to do with AHL playoff eligibility, but more than anything it is about Redmond’s recall. The Ducks, who continue to struggle with injuries in net, will dress Redmond as their backup tonight with Ryan Miller sidelined with a lower-body injury. It is the first NHL experience for a keeper who has played almost exclusively in the ECHL as a pro. The Boston Bruins have been in search of a top-six winger even after acquiring Charlie Coyle and have found their man in Marcus Johansson. The Athletic’s Joe McDonald was the first to report that the team had acquired Johansson from the New Jersey Devils. TSN’s Bob McKenzie adds that the return is a 2019 second-round pick and 2020 fourth-round pick. The Devils will also retain 40% of the impending UFA’s salary – approximately $1.833MM – so as to allow the Bruins room to allow room for bonuses in their year-end cap accounting. The Bruins had been linked to nearly every major rental forward available at the deadline, but seemingly balked at the high prices. While Johansson isn’t exactly the right-shot goal-scoring forward that would have been the ideal fit, he will certainly help with the team’s lack of secondary scoring. While injury issues have limited Johansson’s offensive totals in New Jersey, his per-game production has been back at his regular career levels this season. His shooting percentage is also down, but could improve on a superior team. A creative offensive player, Johansson should add to Boston’s potent power play and could slot in on a line with David Krejci or the newly-acquired Coyle. Bruins GM Don Sweeney opted for the safe play at the deadline, but Johansson has the upside to fit in well in Boston (so long as he can put his past with Brad Marchand behind him). Meanwhile, New Jersey GM Ray Shero deserves credit for the haul he has been able to bring in at the deadline for Brian Boyle, Ben Lovejoy, Keith Kinkaid, and now Johansson. The Devils picked up two seconds, a third, a fourth, and a fifth, as well as young defenseman Connor Carrick in exchange for expiring pieces that haven’t exactly been world-beaters this season. It’s been a nice deadline for New Jersey in an otherwise disappointing season. The Blue Jackets have pulled off another trade and this time, it’s not with Ottawa. Sportsnet’s Elliotte Friedman relays a Nick Kypreos report (via Twitter) that Columbus has acquired goalie Keith Kinkaid from New Jersey. Renaud Lavoie of TVA Sports adds (Twitter link) that New Jersey acquires a fifth-round pick in return while Craig Custance of The Athletic clarifies (via Twitter) that the pick is a 2022 selection. While we believe goaltending is a position of strength for our club with Sergei Bobrovsky and Joonas Korpisalo, we thought it was important to add depth to the position. Keith Kinkaid is an experienced National Hockey League goaltender who will provide that depth as we move through the final month of the regular season and into the spring. The 29-year-old is in the final season of a two-year, $2.5MM contract and is slated to become an unrestricted free agent this summer. If he remains as the number three down the stretch for Columbus, that likely won’t be boosting his prospects in free agency. Red Wings winger Thomas Vanek is no stranger to being part of trade deadline speculation having been dealt in that situation three times already. However, as things stand, it doesn’t appear likely that he’ll be on the move again. GM Ken Holland told reporters, including Ted Kulfan of The Detroit News (Twitter link) that there has been no interest in the 35-year-old so far. Vanek has picked up his play as of late with 13 points in 21 games since the calendar flipped to 2019 which is decent production for a secondary scorer. However, it doesn’t appear to be enough to intrigue anyone just yet. Vanek is a pending unrestricted free agent with a full no-trade clause and carries a $3MM salary and cap hit. The Devils would like to move goaltender Keith Kinkaid by Monday’s trade deadline, reports Fox Sports Midwest’s Andy Strickland (Twitter link). However, he adds that the goalie trade market is pretty weak at the moment. With Cory Schneider locked up long-term plus promising youngster Mackenzie Blackwood waiting in the wings, there isn’t room for the pending unrestricted free agent beyond this season. Kinkaid carries just a $1.25MM cap hit but has struggled this season, posting a 3.36 GAA with a .891 SV% in 41 games. Carolina is set to welcome back a key piece of their forward group as the team announced that center Jordan Staal has been activated off injured reserve. The 30-year-old has missed 30 of the last 32 games due to an upper-body injury. While his output when healthy has been low this season (he has just 11 points in 29 games), he has picked up at least 45 points in each of the last three seasons so it’s reasonable to expect that he’ll be a contributor down the stretch for them. Staal is also consistently one of the top faceoff players in the league, giving the Hurricanes a boost in that regard as well as they continue to chase down a playoff spot. The New Jersey Devils announced they have terminated the conditioning loan of goaltender Cory Schneider and have recalled the veteran netminder. To make room for him, the team has assigned promising goaltender MacKenzie Blackwood to the Binghamton Devils of the AHL. Schneider returns home after showing improvement in his most recent conditioning stint, as he has allowed just five goals over the past two games with Binghamton this weekend, including picking up a big shutout win Saturday over Belleville in which he made 24 out of 26 saves. Schneider has struggled with injuries and success this season. Even with his improved performance this past weekend, he still has a 3.24 GAA and a .881 save percentage with Binghamton over eight games. His numbers in New Jersey have been even worse with a 4.66 GAA and a .852 save percentage. The hope is that he’s starting to recover from his abdominal strain and might be ready to serve as the team’s backup goaltender. The 32-year-old still has another three years on his contract at $6MM per season. As for Blackwood, the team’s future might have to wait some time longer. Blackwood’s impressive play with New Jersey this season has given him the title of goaltender of the future. The 22-year-old has a 2.37 GAA and a .926 save percentage in 13 appearances. There is talk that the team may look to trade Keith Kinkaid, who will be an unrestricted free agent this summer, at the trade deadline, which would allow the team to officially make Blackwood the team’s starter. For now, Blackwood will have to settle for the starting role in Binghamton, where he was recently played at the AHL All-Star game and will bide his time till an opportunity presents itself. Despite rumors that he might want to sign with the New York Rangers and talk that he loves playing in Columbus, it looks like Columbus Blue Jackets winger Artemi Panarin still hasn’t started negotiating with Columbus. In fact, Aaron Portzline of The Athletic reports that the agent for Panarin, Dan Milstein said he wants another meeting with his client before he lets Columbus know whether he’s willing to negotiate a contract extension with the Blue Jackets. Milstein and Panarin met in Miami over the weekend, but Portzline writes that the two will need a second meeting to discuss their what their next step will be. Panarin, who will be an unrestricted free agent this summer, has been unwilling to sign an extension in Columbus with rumors that he wants to move to a city that can give him more exposure. However, Panarin has fit in well with Columbus and has said that he enjoys playing there. The 27-year-old would be one of the most intriguing free-agent options if he chooses to test the open market as he’s having another strong year with 19 goals and 53 points in 46 games and could even break some of his career-highs if he can keep those numbers up. Even if Panarin opts not to negotiate a deal with Columbus, the rumor is that the Blue Jackets would keep him for their playoff run this year. Columbus is currently in third place in the Metropolitan Division with 59 points. NHL.com’s Amanda Stein reports that star forward Taylor Hall practiced on his own today, but it looks unlikely he will join the team on their road trip to face Pittsburgh on Monday. Hall has been out since Dec. 23 with a lower-body injury and missed the All-Star game because of it. However, the team was hoping the Hart Trophy winner would be ready after the break, which he apparently isn’t. Stein adds that head coach John Hynes said that Hall is progressing, but isn’t healing as quickly as originally thought. The New Jersey Devils also made several roster moves today, but didn’t recall goaltender MacKenzie Blackwood. NHL.com’s Amanda Stein reports that the Devils had already decided to go with Keith Kinkaid in goal on Monday. So New Jersey decided to recall Cam Johnson instead, so Blackwood could play in the AHL All-Star Game. The team didn’t want Blackwood to miss the opportunity while sitting on the bench as the team’s backup. While the New York Rangers recalled goaltender Alexandar Georgiev and forward Boo Nieves from Hartford earlier today, it’s been noted that the team didn’t bring back defenseman Ryan Lindgren, but much of that could be because defenseman Neal Pionk might be ready to return to the lineup. Pionk has missed the last three games with a lower-body injury, but the 23-year-old was practicing today with the team along with Kevin Hayes, according to New York Post’s Larry Brooks. Hayes has been out since Jan. 2.